Drooling, crankiness and tears can make teething an ordeal for parents, caregivers and babies alike. Here's help easing the pain — for all of you. 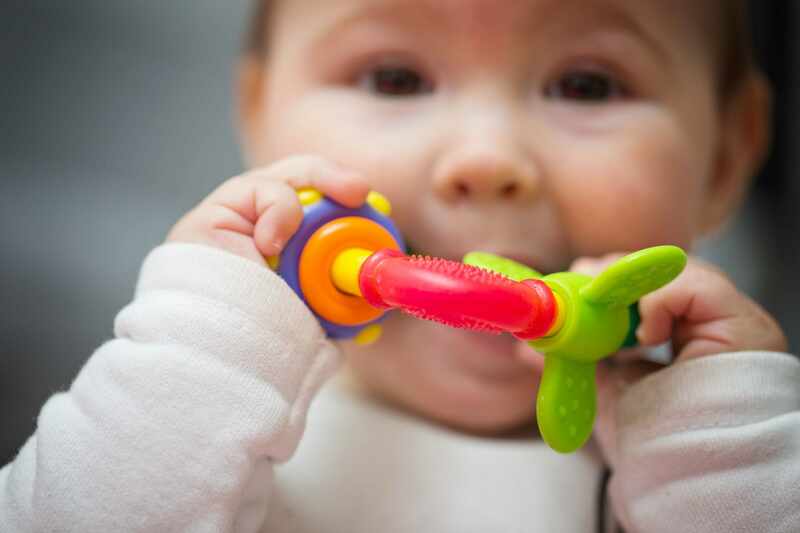 Although timing varies widely, babies often begin teething by about age 6 months. The two bottom front teeth (lower central incisors) are usually the first to appear, followed by the two top front teeth (upper central incisors). Many parents suspect that teething causes fever and diarrhea, but researchers say this isn't true. Teething can cause signs and symptoms in the mouth and gums — but not elsewhere in the body. What's the best way to soothe sore gums? Rub your baby's gums. Use a clean finger or moistened gauze pad to rub your baby's gums. The pressure can ease your baby's discomfort. Keep it cool. A cold washcloth, spoon or chilled teething ring can be soothing on a baby's gums. Don't give your baby a frozen teething ring, however. Contact with extreme cold can be harmful. Offer a teething ring. Try one made of firm rubber. The liquid filled variety may break under the pressure of your baby's chewing. If a bottle seems to work, fill it with water. Prolonged contact with sugar from formula, milk or juice may cause tooth decay. Dry the drool. Excessive drooling is part of the teething process. To prevent skin irritation, keep a clean cloth handy to dry your baby's chin. Consider applying a moisturizer such as a water-based cream or lotion. Try an over-the-counter remedy. If your baby is especially cranky, acetaminophen (Tylenol, others) or ibuprofen (Advil, Children's Motrin, others) might help. Avoid teething medications that contain the pain reliever benzocaine. Benzocaine products have been associated with methemoglobinemia — a rare but serious condition that reduces the amount of oxygen in the blood. Avoid teething medications that contain the pain reliever benzocaine. Benzocaine products have been associated with methemoglobinemia — a rare but serious condition that reduces the amount of oxygen in the blood. The Food and Drug Administration (FDA) also has recommended that parents not use homeopathic teething gels or tablets, which might pose a health risk to babies. Teething can usually be handled at home. Contact your doctor or healthcare provider if your baby develops a fever, seems particularly uncomfortable, or has other signs or symptoms of illness. The problem may be something other than teething.